Adding a fireplace which brings in warmth and style is the desire of every homeowner. It is probably the best way to create a cozy and comfortable ambience within a household. These days homeowners have several options when they are looking forward to fireplaces. These include natural gas or propane models, wood stoves and wood inserts, electric fireplaces and stoves. Not to forget the traditional wood burning fireplaces. So, decide on the kind of fireplace you need for your home and then you can move ahead with installation factors. Fireplace inserts have also become a popular choice due to their easy installation and usability. However, for almost all variants of fireplaces, seek the services of a professional installation service providers. Working with fireplaces involves a lot of accuracy and skill because there is no scope for mistakes. Failure to adhere to certain rules and regulations prescribed by regulatory bodies can lead to fatalities, such as carbon monoxide poisoning as well as other fire hazards. We, at The Original Flame ensure that the installation process is as per the rules and regulations with complete adherence to safety and security. Thus, whatever type you may choose, seek the help of professional fireplace installers. Some of the advantages of using such services include. Specialized Installation: As the years have gone by, there have been a myriad of fireplace alternatives available in the market for consumers to choose from. This means fireplaces can involve working with electricity, combustible gases as well as potentially dangerous emissions. To avoid any unfortunate accidents and without compromising on security, have a professional fireplace installation team do the work for you. Improper installations increase the possibility of fire hazards. This could put the entire house at risk and many insurance companies will not cover you. This is specially if the fireplace is’t professionally installed. Installing Wood Burning Fireplaces: It goes without saying that almost all types of fireplaces are pretty difficult to install in a proper way. Most involve making a spot ready for the fireplace to be in, along with building a vent, or connecting electric and gas lines to the unit. However, in case of wood burning traditional Calgary fireplaces, a chimney installation is also required. Chimneys have to be installed adhering to strict industry guidelines related to safety and any compromise here can lead to disasters. Professional installation services understand the nuances involved with each type of fireplace and can complete the job in an efficient and secure way. Building Permissions: Depending on where you live, installing a fireplace requires a permit and requires the user to follow certain building safety codes. Professional installation services are aware of such permits and rules. This would decrease the likelihood of complications in the near future. Efficiency Ratings: For homeowners who are energy conscious, professional fire installers can help install the fireplace in a proper way to ensure there is no energy wastage. Most modern products come with their own efficiency ratings included. However, there are certain areas such as placement of the fireplaces, ventilation tips etc., that the installers can provide for a better experience. These models are useful for installing in newer homes, or after renovation is complete. This is in the absence of a regular fireplace. They are available with simulated logs and burners are inside a firebox. The advantage of using this model includes the possibility to install it almost anywhere in the house. This is including in tight spaces up against the wall. Installation is done exactly as prescribed by the manufacturers, to ensure proper clearance from combustibles. If an existing wood burning masonry or metal fireplace is present, these can convert them into using gas. Inserts are available with a gas burner, and simulated logs, present inside a special metal casing. This casing then fits into the existing fireplace cavity. Each unit typically comes with a glass front for viewing and metal trim for decorative purposes. Free-standing models can mimic some of the newer variants of wood burning stoves available. They are useful when it comes to supplying heat throughout the house. This is due to its surfaces exposure to the walls of the room. These models also come with glass fronts, usually made of tempered or ceramic glass. Most professionals prefer ceramic glass because of its ability to transmit infrared heat into the rest of the room. These models are popular for withstanding higher temperatures than its other counterparts. 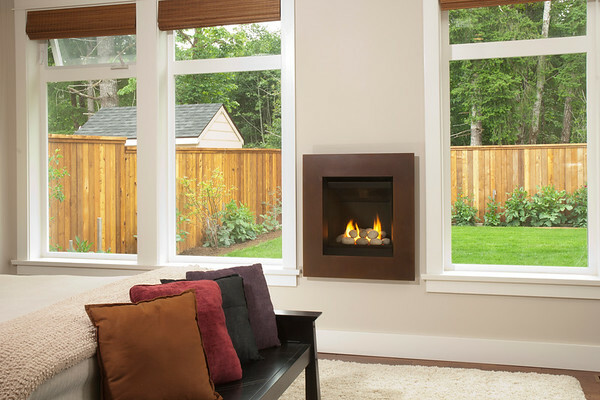 There are certain types of fireplaces which are not advisable inside Canadian houses – these are vent free gas models. These models are available in the United States. These units have a major disadvantage of not having vents. This results in the direct release of harmful gases inside the house. In airtight Canadian homes, this can be major area of concern for air quality and moisture problems. Carbon monoxide poisoning is also a major threat which can prove fatal in some cases. Additionally, any model of fireplaces you choose should always be licensed and certified. The professional installers should also have ample experience in this field as well as a good track record. Any compromise in safety standards can put you and your entire home at risk. Fireplace installation can seem easy at first glance but requires expert knowledge. Eespecially when the clearance areas and safety features are concerned. By entrusting this job to a professional, you will ensure that the fireplace is safe. for working. The Original Flame can help with the purchase, installation and maintenance of fireplaces. Get in touch with us for further information!